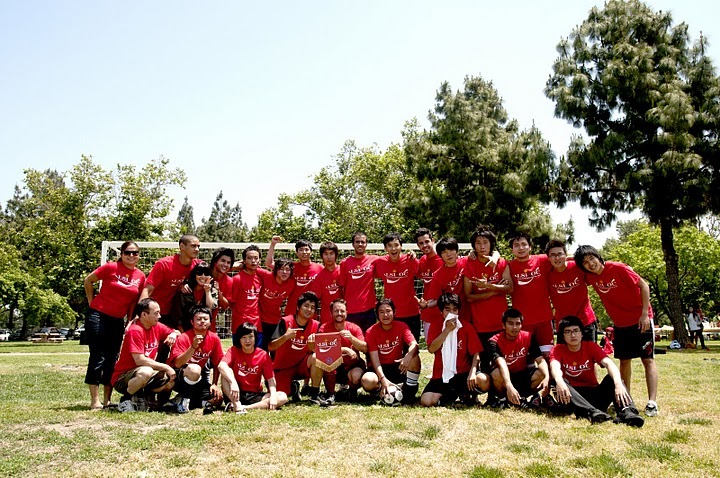 On Friday May 13th , Language Systems International (LSI) held its annual Soccer Tournament between 4 campuses: Torrance, LA, Alhambra, and Orange County (OC). The tournament was very exciting, and the competition between the schools was strong, as usual. Each school was represented by students wearing their school colors. OC students wore red, LA students wore yellow, Torrance students wore gray, and Alhambra students wore green. Some of the countries represented in the tournament included Brazil, Japan, Korea, China, Mexico, Vietnam, Turkey, Libya, Thailand, Chile, Venezuela, Taiwan, and many others. Each team showed up to win, and the students of each campus cheered for their school’s team. Although each school really wanted to win the soccer trophy, there could only be one champion. In the first round, LA defeated Alhambra and Torrance defeated Orange County (OC). That set up the championship match between LA and Torrance. Each school played strong and with a lot of heart, but in the end, Torrance came away with the Championship trophy. They were the best team, represented mostly by a core of talented Brazilian players. Congratulations Torrance! During the tournament students had the opportunity to hang out with their teachers and friends while enjoying a beautiful sunny day in Southern California. After the games were finished and the trophy had been passed on to Torrance, LSI provided all the students and players with a pizza lunch in the shade. The soccer tournament was a very successful event, and many students kept asking, “When’s the next big LSI event?” Well, to answer their question, the next major event involving all 4 LSI schools will be the annual Beach Party in August when LSI will hold the exciting beach volleyball tournament! Mark your calendar and get ready to see once again proud and supportive LSI students wearing red, yellow, gray, and green. Ty, the Program Coordinator at the OC, wrote this post about the soccer tournament, but couldn't post it because of computer problems. Thank you, Ty!! !